Today is February 5, 2017 and on March 5, 1770 Crispus Attucks became the first person killed in the Boston massacre and is widely considered to be the first American casualty in the American Revolutionary War. 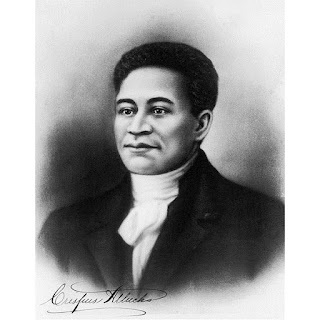 It is believed that Attucks was born a slave in Framingham, Massachusetts in 1723. Both his parents were slaves owned by Colonel Buckminster from Framingham, Massachusetts. Documents describe Crispus as a man of mixed parentage. His father, Prince, was an African slave and his mother, Nancy, was a Wampanoag or Natick Indian forced into slavery. When he was about 27 years old he escaped seeking freedom. He used the name Michael Johnson as an alias and found work on a whaling ship. Being a whaler was a physically demanding and dangerous job. It is believed that Crispus left his whaler job sometime during the French Indian War between 1754 and 1760 to become a merchant seaman. He never raised suspicion as ran-away slave as his employers considered him Indian. Between sailings he would work as a rope maker in Boston Harbor. On the night of March 5, 1770 he was the first to die in the event known as the Boston Massacre. If you want to learn more about him I suggest you visit crispusattucksmuseum.org.